I managed to modify Epson Photo R220 for direct PCB printing and used MISPRO yellow ink for it. I am drying the ink with my hot-air station at 400 C. It is quite clean and fast. Printing and drying is finished in 3 minutes. I etched the PCB with Fe-Cl3. Results are not as good as Volkan's results but satisfactory. There is no problem with 8 MIL traces. Problems occur if dust in air drops on the printed image while it is still wet. 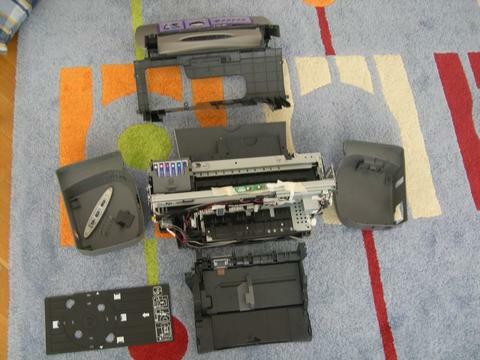 If printer is located in a clean box, I think every thing would be OK down to 6 or even down to 3 MIL traces. R220 is very very easy printer to modify, since its printing head height is adjustable. I recommend it to you. Even with MIS PRO ink, you should head clean your printer (printer does it for you) if 2 days passed. It clogs the printer head in 48 hours! tristan.devans says: "Just ran an 8x10" piece of 1/32 through my modified r280 last night! 1/32 does work by just raising the set screws to their max positions. Thanks for the help!" cause of high shipping costs to foreign countries. has anyone tried to use durabrite ink instead of mispro yellow? TakeThisOuTgiacomoboviospam at tin.it asks: " May I have more information about how to modify R220 printer ? Merry Christmas and Happy New Year and thanks for your help. OK...got the printer apart, but I keep coming up with the status monitor asking for the CD/DVD tray to be removed and the door closed....where's the interlock???? And how do you align the PCB's for second side printing, or a second pass for solder mask and silk screen layers??? ?